Ola loves! We loooooves Double Creatives Inspiration ideas! and here's what you guys getting for todays *2012 New Years Special Doubles! 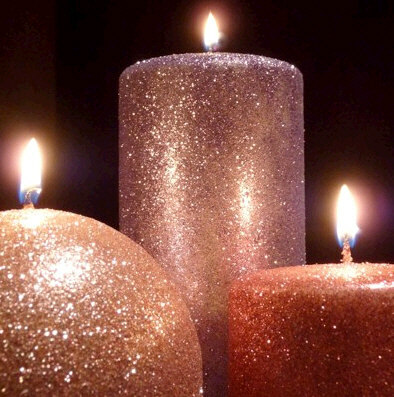 For the second ideas - have you heard of the awesome glitter & shimmer candles? Thanks to Love Pink Stilettoes we'd like to share with you these awesome craft project! They're perfect for any celebration - from weddings to dinner parties to any other occasion. And they're not difficult to make either! So let's get busy and make your very own shimmers & glitters! 1. To begin, laid out a large tablecloth (or perhaps old flat sheet). No matter how careful you are, this is still a project involving glitter – its inevitable that you’ll have some mess! 2. Next, place the candle in the box to lightly (and evenly) coat it with the spray adhesive. 3. Immediately begin spooning the glitter onto the candle. Use the back side of the spoon to help distribute and smooth the glitter. The box will catch the excess and you’ll then be able to gently roll the candle along the bottom to help it re-adhere. 4. 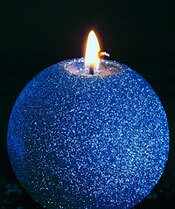 After you are satisfied with the look of your candle, set it aside to dry for at least one hour. Just to be sure, you can keep dry overnight. 1 .Wear gloves to avoid “sticky fingers” from the spray adhesive. (unles you dont mind washing your hands at least 4 times ) Test with the gloves first to prevent them from sticking to the adhesive and pulling glitter off the surface. 2. After the adhesive is fully set, some glitter will still slough off with use. Handle with care and don’t let them touch your clothing.